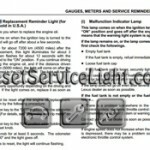 How do you reset oil service light Lexus ES 330. From years: 2004, 2005, 2006. Reset Engine Oil Replacement Reminder Light for a Lexus ES 330. This light reminds you when to replace the engine oil. This light will come on when the ignition key is turned to the “ON” position and will go off after about a few seconds. When you drive for about 7200 km (4500 miles) after the engine oil replacement, this light illuminates for about 3 seconds and then flashes for about 12 seconds with the ignition key turned to the “ON” position. If you continue driving without replacing the engine oil, and if the distance driven exceeds 8000 km (5000 miles), the light will come on after the ignition key is turned to the “ON” position. The light will remain on thereafter. Hold down the trip meter reset knob while turning the ignition key to the run position, one position before starting engine. Hold down the button for 5 seconds or more. The odometer indicates “00000″ and the light goes off. All information is taken from the Lexus ES 330 owners manual. 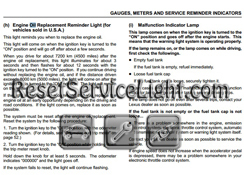 That it is the full procedure how to reset oil service light Lexus ES 330. If you like to reset any maintenance oil light after an oil change. Or reset check engine light, airbag light, inspection key or insp errors when maint reqd, for Lexus cars. Or any warning light for service reminder which appears on the display. Write in the search box the car name for which you want to find information, and find how to reset other service reminders when by yourself. Thanks for the reset info,it worked the first time and was clearly described!!! !